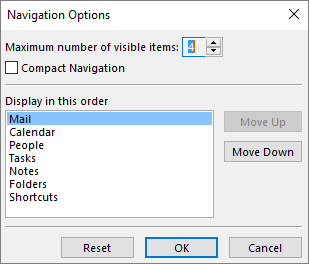 The quick access bar is an important part of your Outlook experience. And it’s an easy way for you to move among the top Outlook features—Mail, Calendar, People, and Tasks. The bar is in addition to the standard tabs and ribbons that provide you with an assortment of tools and options to help you use and manage Outlook. Tip: If you don’t like the changes you made, or just want to start over, choose Reset.